Late this afternoon sea fog smothered a large area of the coastline of the Hunter. Exposed areas of Newcastle, Lake Macquarie and Port Stephens overlooking the Pacific experienced the rare fog. The fog started to develop around 5:30pm and in Newcastle it was still present until sunset. 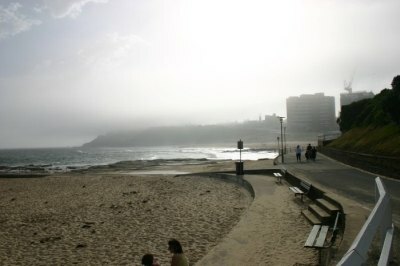 This kind of sea fog is rare in many areas of New South Wales. The last time sea fog was recorded in Newcastle was on the 27 February 2001. Sea fog forms when humidity levels are high combined with an onshore wind or sea breeze that blows over a cool sea surface. Condensation often occurs when the cooler air from the sea breeze interacts with the much warmer air on the shore.